So, we spent the last week of the children's summer holidays up in Northumberland, in a country park kind of in the middle of nowhere! Now, while the whole 'in the middle of nowhere', 'surrounded by nothing but pine tree forests' etc. as the brochure said, is really our (i.e self and the husband) idea of bliss, we realise that our girls don't exactly share the same sentiments yet. They are very activity oriented and would like to have something to do. Anyway, so, that's how we found ourselves booking them onto some basic horse riding lessons at Swinhoe farm and riding centre. So, what does a horse riding lesson to a complete novice look like. Here, at the centre, it was around 30-40 mins in duration, costing around £15 each. Once the helmets were fitted for size, the girls had to climb a little stair from where they mounted their horse. Once saddled, their feet were fitted into the stirrups and they were given basic instruction on how to hold the reins and they were led into a paddock, with a helper walking alongside. Once inside, the lead instructor Claire, had a structured routine and got them to gently canter, trot and do start and stops from various points. This gave them familiarity over basic rein control. Towards the end of the session on each day, she got them to attempt jumps of varying heights. This was quite interesting to watch. For instance, my older one's horse seemed like a well-behaved fellow and jumped easily and gracefully. My younger one's horse, however, seemed to have a little personality of his own and decided he didn't want to do it. So, on a couple of occasions, he knocked the pole down and walked right through (somewhat mirroring the personality of his little rider!). Mika seems to have his own ideas about the lesson ! An adult long-time client of theirs sat next to me as I watched our girls. She was all praises for this riding centre and had, in fact, come here to go on a pony hack later that day. All in all, I would say that these sessions of horse riding have given us an insight into what it entails. We were told that if we wished to pursue this closer home, we would do well to enrol with a trainer who has been accredited by the British Horse Society (BHS). 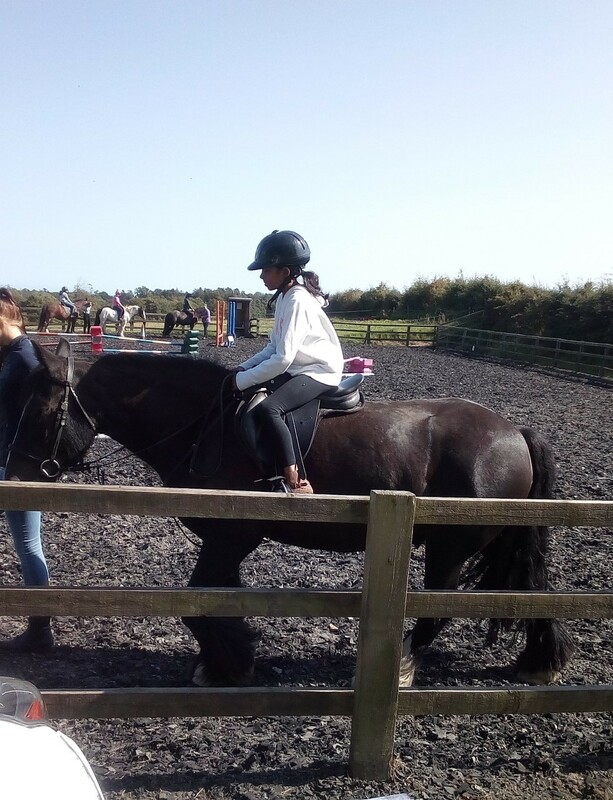 Swinhoe farm also runs a Pony club for regular learners and we could see some of the kids from this club clearly show their confidence with the horse. Whilst the practical stuff - i.e the actual lesson itself was quite well thought out, I would have personally liked a bit more theory or background just before the lesson. For instance, to the complete beginner, it would help if they knew what kind of horse they were on (later, on asking, I learnt it was called a cob), what the different accessories were called etc. 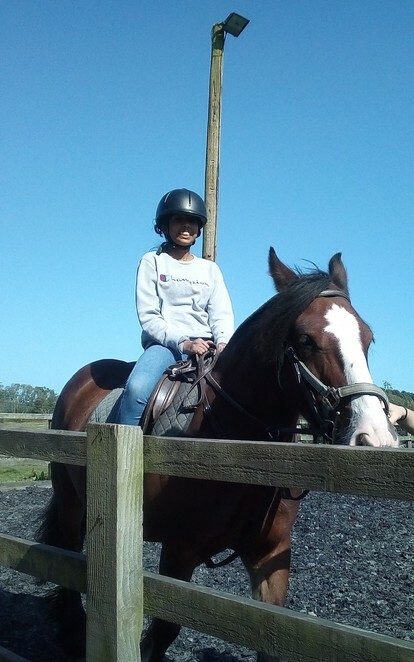 So, if you are holidaying up north and want to try something like this, I would definitely recommend giving horse riding lessons at Swinhoe a go! Why? You never know, you might end up loving horse riding !